Your food and garden waste bin is collected every fortnight all year round. To find out when your collections are, please find your street in our directory. You can also take excess garden waste to our Household Recycling and Reuse Centre (the tip). If you don’t have a brown-lidded bin, or you need a new one, please visit our bin request page. Please note that your bins will not be collected if rubbish is compacted, bin lids can’t close or bins are too heavy to safely be collected. Please do not put plastic bags in your bin. You can however use compostable liners. If your bin has not been collected you should have received a bin tag informing you of the reasons why this has happened. If your bin has not been collected and you have not received a bin tag please visit the missed bins page to report it. What can I put in my brown-lidded (garden waste) bin? Food waste including cooked and uncooked food, meat, fish, bones, vegetables and fruit peelings, plate scrapings. 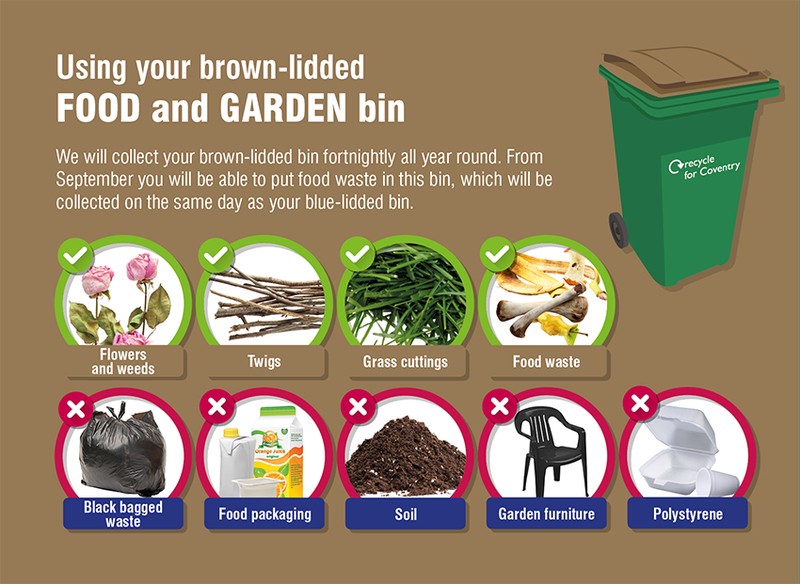 Putting non-compostable items in your brown-lidded bin can cause lots of problems with the composting process. Common contaminations include plastics bags, food packaging, plant pots and rubble. Food waste can now be composted along with your garden waste. The process the materials will go through is In-Vessel composting. Once on site materials are shredded to a uniform size. The process is started by naturally occurring microorganisms which break the materials down and increase the temperature to 60-70 degrees. The temperatures will kill pathogens, weeds and seeds and this first stage takes 1-3 weeks. Once the initial stage is completed the materials are carefully monitored to ensure they reach the required temperature and oxygen and moisture levels and measured to ensure the materials are sanitised. Once sanitised the compost is left to mature, this can take 10-14 weeks. If you wanted to start composting at home you can purchase a subsidised compost bin through Coventry Recycling Club. More information on home composting.